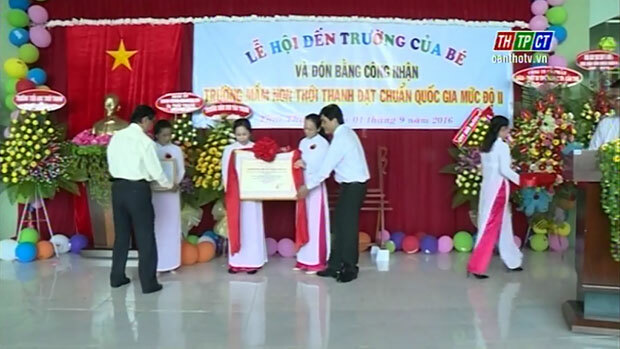 Thới Thạnh nursery school, Thới Lai district has just held the opening ceremony for the new school year of 2016-2017 and received national – standard certificate. Thới Thạnh Pre-school Meets National Standards 2. Mr. Nguyễn Xuân Hải – Member of the city Party Committee, Chief of Interior Department attended the ceremony. The school is built with the investment capital of VND 21 billion, including 19 classrooms and function rooms. The school has had 26 officials, teachers and civil servants; 100% of which meet standards and 62% exceed standards. To now, Thới Lai district has had 21 schools from nursery to secondary schools qualifying for national standards./.